Nintendo is likely doing something to promote happy and healthy hearts that will be announced this week. A press conference will be held tomorrow so that Nintendo and the American Heart Association can announce... something. The companies put out a press release that is somewhat vague, but says that they'll be making a joint announcement tomorrow, May 17. It's not that hard to figure out what will probably happen. 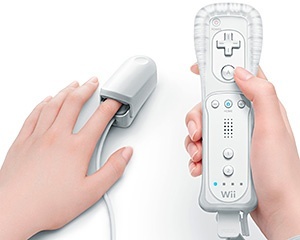 Nintendo has already announced its Wii Vitality Sensor, a device that clips onto the finger and reads a person's pulse, but hasn't really told anyone what it'll be useful for. The American Heart Association has a lot to do with the heart, I gather, so Nintendo may finally reveal what this Vitality Sensor will do. Nintendo's Reggie Fils-Aime has defended the Vitality Sensor in the past, saying it will "will bring forth an experience that you will say, 'Wow, I get it.'" If the announcement doesn't make us get it, or has nothing to do with the Vitality Sensor, it would be quite the oddity. With the AHA endorsing a Nintendo product, it'll likely be another fitness or self-improvement game along the lines of Wii Fit and Calvin Tucker's Redneck Jamboree.